William O. Boyd, P.A. is a law firm located in Central Florida that limits our practice to the areas of estate planning and administration. 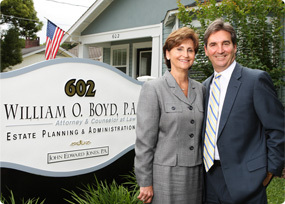 With over 100 years of combined experience in the creation of estate plans and the administration of probate estates and trusts, Mr. Boyd and our support staff has the distinct ability to provide our clients with the attentiveness and accessibility of a small firm with the experience and resources that are commonly associated with larger firms. We pride ourselves in providing individual attention to each of our clients, with Bill Boyd personally handling the design, creation, signing and completion of each estate plan, from the initial consultation to the signing of the documents. Mr. Boyd has more than 35 years of experience in estate planning which gives him the insight to focus on you and your desires for your family and your future to create a unique and personal estate plan for you. The firm can not only assist you with all areas of estate planning, but we are also able to use our years of experience and understanding of what a family is going through to make the management, probate, or trust administration process as efficient and stress-free as possible at the time of incapacitation or death. We will guide your family compassionately and work closely with attorneys-in-fact, health care surrogates, personal representatives, trustees and other fiduciaries to ensure your wishes are carried out. Whatever your needs are regarding wills, trusts, powers of attorney, living wills, health care directives, estate tax planning, probate or trust administration, we have the experience and resources to assist you and your family from generation to generation.